Da Chen Qi Tang relieves constipation (hot-type) with hard stool. Symptoms may include dry lips or nostrils, bloating, flatulence, acute appendicitis, acute cholecystitis, acute pancreatitis, pain in abdomen worse with pressure, hard distended abdomen, fullness in abdomen due to accumulation, post-operative constipation. This herbal may cause vomiting or strong diarrhea. Adult Serving: 1 batch herbs prepared as decoction. Drink all in 24 hours. Preparation: In stainless or ceramic pan, add 2 cups clean water and loose contents (except small packet). Bring to boil, reduce heat and simmer 30 minutes. Add contents of small packet and turn off burner. Cool slightly and filter into glass container with cover. Drink all within 24 hours. Ingredients: rehum palmatum radix, mirabilitum, magnolia cortex, citrus aurantium fructus. Size: 1 batch herbs (including 1 small packet). 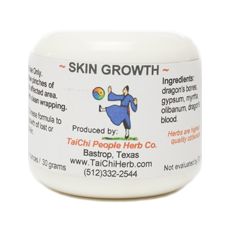 Produced by TaiChi People Herb Co, LLC in USA.